“The Great Composer You’ve Never Heard Of” – the most recent “PostClassical” broadcast via the WWFM Classical Network – spends two hours exploring the astounding achievements of Silvestre Revueltas (1899-1940). The show also reveals how Revueltas’s colleague Carlos Chavez – a lesser composer, but with more institutional clout – suppressed Revueltas’s music. It’s all here. As readers of this blog know, Revueltas is the composer most championed by my PostClassical Ensemble in DC. He’s also the main topic of “Copland and Mexico,” the NEH-funded “Music Unwound” program I produce around the US. In many respects, Revueltas bears comparison with George Gershwin: a self-invented composer of genius who mines the vernacular without apology or discomfort. And just as Gershwin was the victim of a “Gershwin threat” that pigeon-holed him as a dilettante interloper, so it was with Revueltas. Gershwin’s influential detractors included Aaron Copland. Revueltas was dismissed as a gifted amateur by his one-time colleague Chavez. Copland’s view of Revueltas was comparable: he expressed wary admiration for Revueltas’s native gift: “Unfortunately, he was never able to break away from a certain dilettantism that makes even his best compositions suffer from sketchy workmanship.” Chavez chose to patronize Revueltas as a fallen disciple. If Copland mainly neglected Gershwin, he increasingly appreciated ingredients of incipient greatness. Chavez, by comparison, actively excluded Revueltas from the many Mexican programs he influentially curated in Mexico and the United States. Revueltas’s reputation is lately on the upswing – his music will be far longer remembered than that of Chavez. 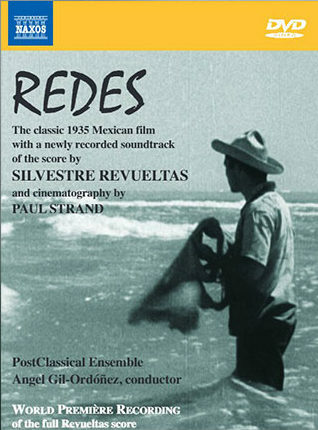 Among his peak achievements is the score for the 1935 film Redes, an uneasy partnership with Paul Strand and Fred Zinnemann. The former – like Copland, like John Steinbeck and Langston Hughes – sought inspiration from Mexico’s artists on the left. The latter – later the Hollywood director of High Noon — was in flight from Hitler’s Europe. The “nets” of the title ensnare both fish and poor fishermen. The resulting film is as epic and iconic, flawed and unfinished as the Mexican Revolution itself. By the way, Noche de los mayas — the “Revueltas” score championed by Gustavo Dudamel and so many others — wasn’t composed by Revueltas. It’s a kitsch confection created by Jose Limantour after Revueltas’s death, cannibalizing Revueltas’s score for a film of no distinction. Stick with Redes.